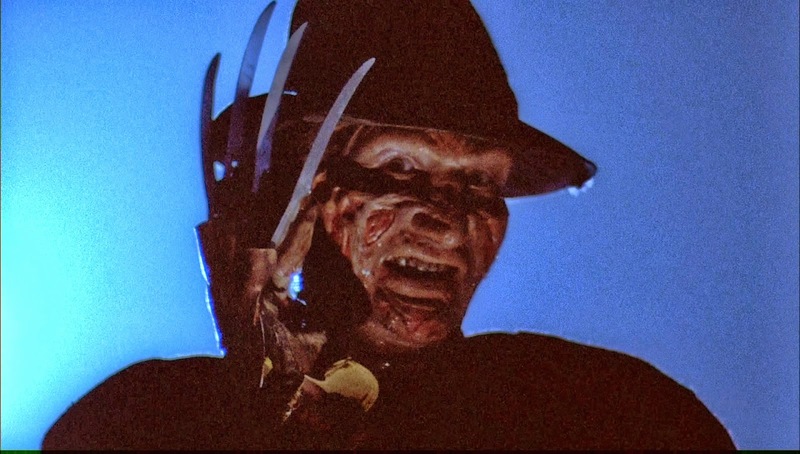 I feel like most people who know me know about my deep and long lasting love of everything Freddy Krueger. Usually I'm the one they ask "Hey, which movie did Freddy kill that kid this way?" or "What was the name of the blonde girl in Elm Street 4?" or "Did Freddy really beat Jason?". It's all generally harmless questions that I enjoy discussing with casual fans or just those who haven't seen the series in a while. And now that we're reaching 30 years of the first Elm Street movie, there's going to be a lot of questions. But one question I usually have a split reaction to is the question of "Hey, remember that Elm Street TV series?". I usually have to stop myself from shuddering at the mentioning of it. Ok, for the uninitiated, Freddy's Nightmares was a Tales From The Crypt/Twilight Zone-like show that was split into an hour of tales. After the first episode reached it's conclusion, the second part would begin thanks to a character that was either in the background of the first episode and would carry on from there. Freddy would pop in maybe once in a while to be a part of the episode, but other than being the host and having odd host segments, he didn't really do much but set up the story. A few witty comments here, a cameo there. It was more of a "Freddy reads us a story from his book of Springwood history". 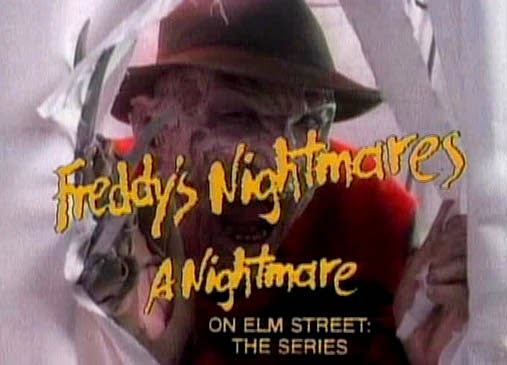 The first episode served as a way to setup Freddy as a whole. It was done by Tobe Hooper, who had done Eaten Alive, a movie that starred Robert Englund early in his career, as well as Texas Chainsaw Massacre and many other iconic horror movies. It was a good effort and a very entertaining hour to watch. Cleverly, Robert's face was shrouded throughout the whole episode so you couldn't entirely see Freddy's real face. A fun episode to watch, especially since up until this, we had no true scenes of Freddy being burned. Robert DID still put out a great effort. Sadly, that's where the fun declines. After the first episode, despite many future stars like Mariska Hargitay and Brad Pitt and familiar faces in horror like Jill Whitlow starring in episodes, the seasons just went downhill. The episodes felt boring. They kinda dragged on. The effects were awful(even though the budget was lower than most other shows at the time. 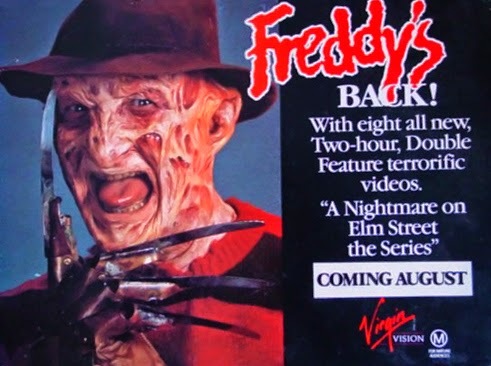 The creativity wasn't all there, corny stories, bad acting and despite people like Mick Garris, Tom McLoughlin and even Freddy himself, Robert Englund directed an episode, this series was meant to be nothing more than an attempt to make Freddy more known in the public eye. And to a degree, it worked because by 1989, Freddy was EVERYWHERE and became a huge public figure. Some of the episodes were worth at least one watch but it didn't last beyond two seasons mainly due to it's racy content, budget and scheduling. 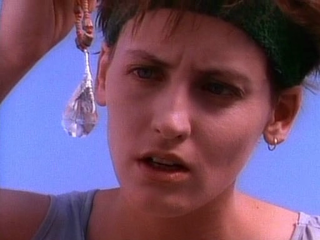 The greatest episode may just well be the Mick Garris-directed episode entitled "Killer Instinct" starring Lori Petty in which she finds a magic stone that makes her a better athlete.. Normally, out of frustration, I'd spoil it further. But it must be appreciated as top level 80s cheese, so watch it and discover why the line "I'm a bullet, I'm a missile, I'm a rocket to the moon” comes up in Nightmare fans discussions. It truly is worth watching this episode for the cheese alone. Lori Petty. Magic Stone. Headband. I give you the 1980s, ladies and gentlemen. Funny story: After my 7th birthday, I decided to invite my next door neighbor to stay over after the party to sit and play with my new gifts(it was a Ninja Turtles party in 1990, so imagine all the amazing Turtles figures I received.) and also enjoy the Freddy's Nightmares marathon that was being played on our local station. It was a pretty fun afternoon and served as a solid memory of Freddy invading my childhood. Years later I'd buy the entire series in a bootleg set for $35 dollars. It had been almost 20 years since I saw the show last and for a good few months, I watched at least 3 episodes every night until the full series had been completed. That's right. I'm admitting to watching the ENTIRE SERIES. Although, my favorite line, even moreso than the Lori Petty line mentioned in above was after an episode involving drugs and the final shot is a sad Freddy saying "Drugs. Now that's a REAL nightmare.". I'm assuming Freddy's feeling remorse only because drugs killed someone and he didn't. Other than that, I have a hard time thinking Freddy truly cares for anyone in Springwood considering they turned him into a human s'more. The show was kind of popular enough to get a few VHS releases in the late 80s/early 90s. I actually own one. Which one? I really don't know. I'm too terrified to play it. The series has yet to see a legit release in America, but the first series got released in 2003 in Ireland with promises of the second series to follow. As you can imagine, the first series didn't sell, so no dice on the second series. Thankfully, two episode, the memorable "Killer Instinct" episode was released alongside "It's A Miserable Life" were included on the BluRay set released in 2011. So if you ever, EVER get bored and decide you need to either kill an hour or yourself, this is a good way to do both. The show is as a bad as it gets. But I gotta say, as an Elm Street fan, it's still better than Freddy's Dead. does'nt seems like much horror to me, seriously the horor in movies and books have died, the just use the old concepts to bring a new nothing. Nothing new in horror anymore.